Netflix’s Pricing Power | Intrinsic Investing | Intrinsic Investing is a publication of Ensemble Capital Management, LLC. Ensemble Capital is a registered investment advisor located in Burlingame, CA, midway between San Francisco and Silicon Valley. The firm currently manages approximately $915 million on behalf of private clients, charitable institutions, and a publically traded mutual fund. Netflix (NFLX) has demonstrated a torrid pace of growth since launching its stand-alone streaming video service in 2011, with paying subscribers growing at a 30% CAGR through the end of 2018. What’s less talked about is the strong pricing power Netflix has shown over the past 5 years since announcing its first price increase in May 2014, growing pricing globally at a 5% clip (7% in the US) since. Despite this increase in prices, it has continued to show very strong momentum in signing up new customers for its service around the world. 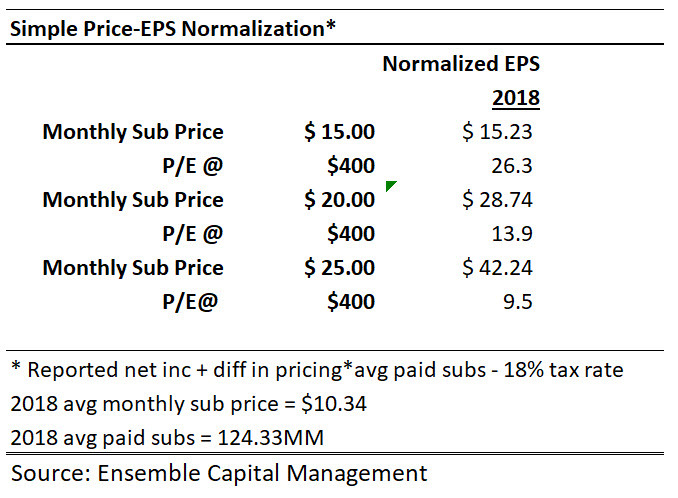 Source: Ensemble Capital Management and Netflix, Inc.
We’ve talked in the past about our thesis on Netflix and its powerful moat characteristics. According to Warren Buffett, the definition of a good business is one that has pricing power. We believe Netflix has it in spades, and expect that they will announce regular price increases over time that will allow revenue to grow faster than subscribers. This is partly the result of its history of being a classic disruptor, offering a “good enough”, low price service to win customers. However, over time, it has transformed into a great service by leveraging the capabilities of the new medium over which it serves its customers, the Internet for direct distribution and a variety of devices outside the television for consumption of media. In the process, it has increasingly won over large swaths of new customers by being the better experience and investing heavily to build the breadth and quality of its content that has earned it a place next to the longstanding leader in quality content, HBO. Despite steadily increasing the quality of its service for customers, Netflix’s pricing has lagged the growth of that consumer value leading to the build up of a large consumer surplus. That surplus, or the excess consumer value over the price of the service, is an important factor that has driven such a rapid rate of growth for the service. The bigger the surplus, the better the deal for the consumer. But this also results in a sub-optimal return for the shareholder, at least in the short run, which can look like an inferior business model if you don’t look more carefully. 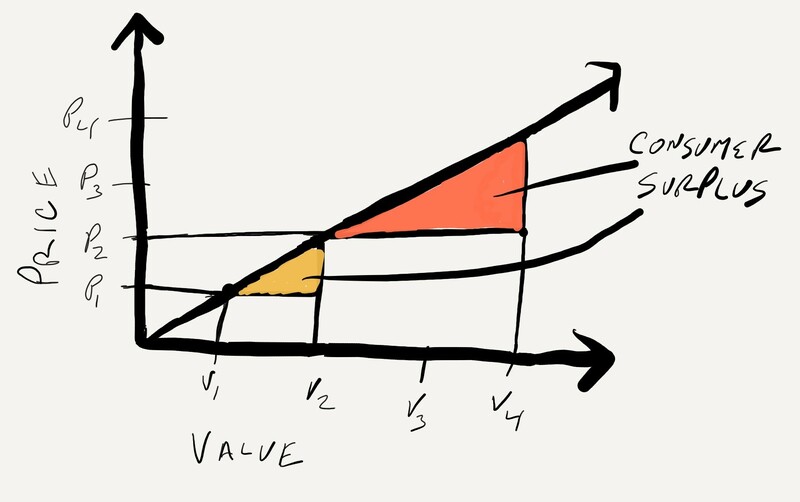 The power of the model is to realize that the consumer surplus represents latent pricing power that can be reallocated via price increases or reinvestment changes towards future profits for shareholders. In Netflix’s case, we believe this is an important lever in managing the rate of its growth and returns. By offering a compelling value proposition to incremental consumers, Netflix drives subscriber growth because it is a fantastic deal at $10/month. The consumer surplus is an investment in Netflix’s rapid growth, an implicit subscriber acquisition expense in the form of foregone revenue and profit, intentionally leveraged to quickly scale so that nearly all traditional media incumbents would be left too far behind when they awoke to the direct to consumer global scale streaming video opportunity. It’s clear at this point that this strategic goal has either been accomplished or nearly has. Over time, we believe prices can be raised substantially to improve the economics of the business, potentially to the detriment of subscriber growth because it will be a less compelling offer. If the service has stickiness to it (we believe it does), then the vast majority of existing customers are unlikely to churn off as that surplus decreases. The result will be higher prices, higher profits, but slower growth. However, that assumes the value of the service remains constant. 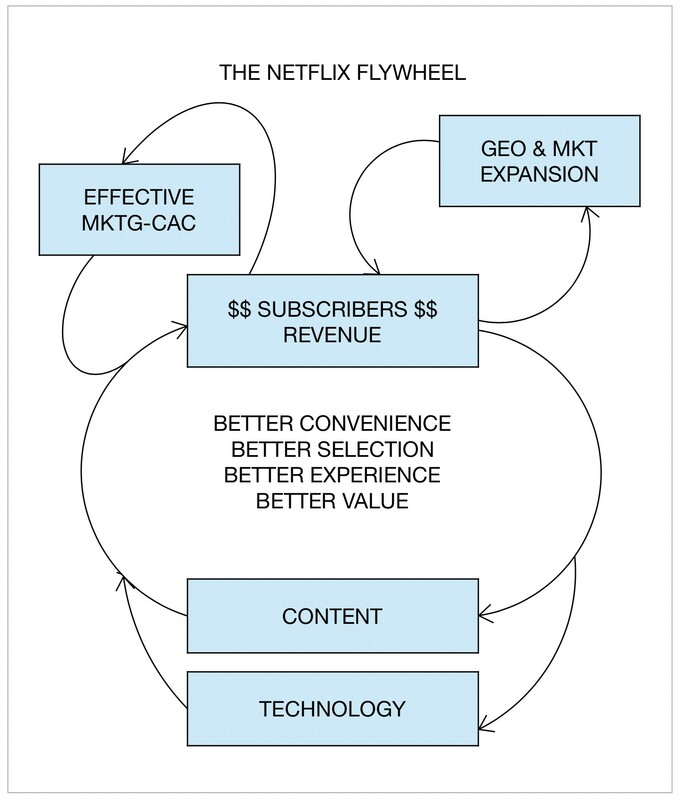 In Netflix’s case, by continually reinvesting a substantial portion of incremental revenue into improving the service experience and increasing its catalog of quality content, it is continually increasing the value of the service for all of its subscribers, which plays into a classic network effect moat. When coupled with a content scale moat, it becomes an increasingly tougher barrier for competitors to overcome. And that is really the secret sauce to Figure 1 that shows accelerating subscriber additions even as prices have risen over the past 5 years, while Figure 2 shows how consumer surplus can increase even with higher prices for the consumer, so long as value creation rises faster. 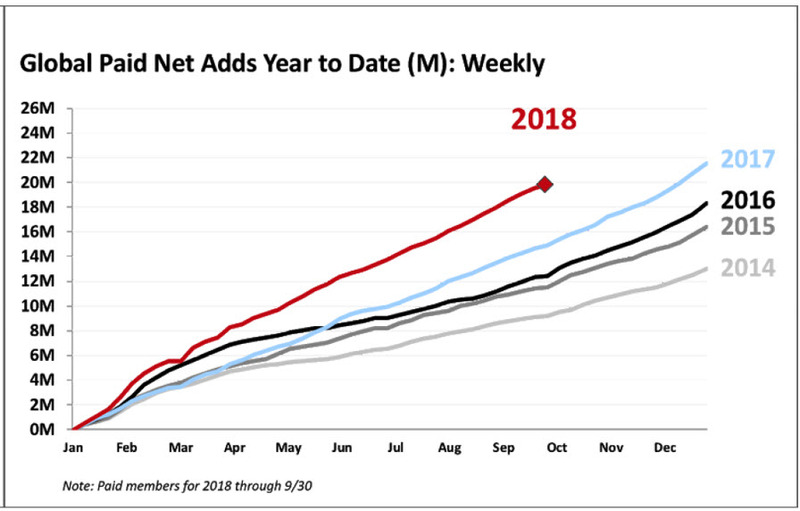 Netflix has continually increased the value of its service even as it has asked its customers to pay more, which has maintained its torrid growth rate at a massive global scale with 100MM+ subscribers and forecasted to grow by 28MM subscribers by the end of this year. That is an incremental $4B in revenue in 2018 alone enabling (via cash generation and capital market access) $7B in funding towards additional content, subscriber growth and scaling initiatives, and improved service investments. This also fits another of Buffett’s requirements for a great business, i.e. Netflix is a business that is focused on growing its moat every day. And management has proven itself highly competent in both understanding the levers they need to command to do so, while also focusing on the right decisions for the business to maximize its value for the long term. 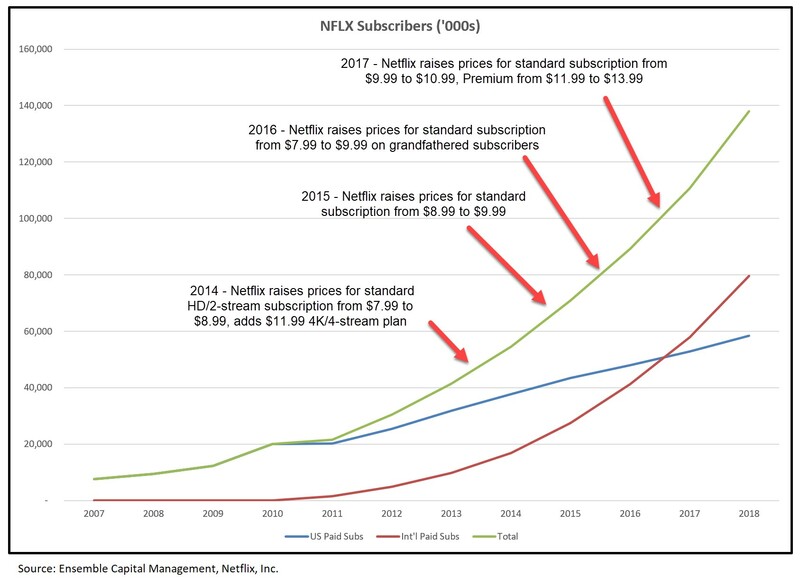 As Netflix approaches mature levels of growth in specific markets (like the US), we believe it will make a rational shift in both pricing strategy and incremental reinvestment allocations towards a more balanced sharing of the value it delivers between its customers and shareholders, resulting in much greater profitability than is currently observed in reported numbers. To this point, the company has committed to growing its annual operating margin moderately going forward, a position that plays to our view on the strategic trade off between growth, profitability, and pricing while allowing the company to continue investing in maximizing the development and capture of the global long term growth opportunity in streaming video content. It’s hard to argue that the service isn’t worth more than its current $10/month based on objective data like viewer engagement, content quality and breadth, price-user analysis, and anecdotal evidence. There is a growing proportion of people that are “cutting the cord” in favor of online entertainment choices, the leader among them being Netflix or, as is more often the case in international markets, discovering and signing up to view talked about differentiated original content on Netflix. Therefore, an assumption that the service’s value to consumers as it currently stands could be worth $15-20/month and growing to $25+ over the next decade does not seem wildly optimistic to us. And if you were to believe that, then paying an average of 20x normalized current earnings for the disruptive runaway leader in the global scale media business, growing over 20%/yr with a long growth runway, scaling moat, and increasing profitability looks reasonable in our view. As of the date of this blog post, clients invested in Ensemble Capital Management’s core equity strategy own shares of Netflix (NFLX). The company represents only a percentage of the full strategy. As a result of client-specific circumstances, individual clients may hold positions that are not part of Ensemble Capital’s core equity strategy. Ensemble is a fully discretionary advisor and may exit a portfolio position at any time without notice, in its own discretion.